For Derry-Londonderry’s City of Culture celebrations, Derry City Council called upon Belfast-based production company Wackiki to help ring in their year as the UK’s inaugural City of Culture. Celebrations for this unique event were led by a spectacular pyrotechnic performance from Walk the Plank, one of the UK’s leading forces in creative event production. 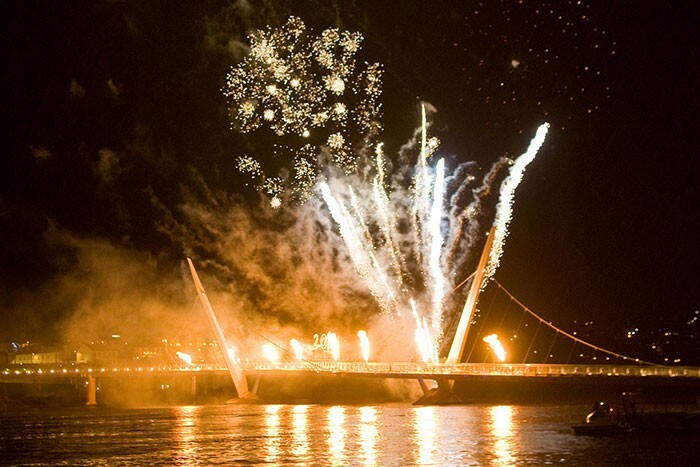 Based around a firework display on the banks of the city’s River Foyle, from moving speedboats and on the deck of the recently built Peace Bridge, Wackiki provided audio coverage across a 2.5km stretch along the river’s edge. Working closely with Walk the Plank’s own Melvyn Coote, Wackiki designed a system that could be cleverly controlled from the fixed mix position, and also wirelessly from any point along the system’s stretch. Wackiki were the first Irish company to provide a system of this kind. Starting from the recently re-imagined Ebrington concert site, multiply stacked L’Acoustic dV-DOSC speaker systems were strategically placed from one bank of the river to the other, and then along the quay, passed the city’s council offices and beyond. The system was powered exclusively using Lab.gruppen’s PLM Series of amplifiers, and was controlled using the built-in Lake Controller software, via Wackiki’s self-designed wireless system. At mix position, Wackiki provided a Yamaha M7CL, equipped with a Dante Network card from Audinate, the perfect partner for Lab.gruppen’s PLM series. Audio was then transmitted through an optical infrastructure, run across the entire stretch of the PA system, with a back-up analogue signal sent wirelessly through an RF transmitter. Ally de Courcy from TMB UK provided a Proplex Ethernet switch system for each amp rack, which simultaneously allowed for both control of the Lake system and playback through the Dante Network. The system benefitted from the PLM series’ ability to seamlessly switch from analogue and digital audio sources, for redundancy and the ability to control any point or combination of points in the system from any point via Lake Controller laptop. At the same time, a time code signal was sent from the M7CL across the Peace Bridge to the technicians from Walk the Plank in order to fully integrate and synchronize the pyrotechnic and musical celebrations. Battling against Irish winter weather, working across both pedestrian and traffic zones on the busiest night of any city centre, Wackiki’s combination of both local and national crew and technicians smoothly delivered a faultless production.